With a script based on the on the ordeal of Indian nurses in the city of Tikrit, Iraq in 2014, Mahesh Narayanan, in his feature debut, uses the events to present the portrait of a woman, in a cinematic process that netted Parvathy Thiruvoth (the protagonist) the Best Female Actor at the 48th International Film Festival of India, becoming the first ever Indian film actor to win the award. Sameera is a quick-tempered and determined nurse in Kerala, who is set on moving to Iraq, where the wages are much higher. Her family, however, disapproves, and eventually, she and her husband, Faizal, get divorced, with the custody of their only child, Ibrahim, staying with his father. At that time, a colleague, Shaheed, who knows of her problems and seems to have had a crush on her for quite some time, suggests for the two of them to get married. She agrees, kind of reluctantly, and they finally manage to move to Tikrit in 2014, while Sameera is pregnant. Eventually, her son joins them but has a hard time to get used to the fact that his mother is now married to Shaheed, with the latter deciding to move to Mosul with the army medical team, in order to give the two some space. Soon after, though, Mosul falls in the hands of ISIS, as their army takes over Iraq. Both Shaheed and Sameera soon find themselves at the mercy of the ISIS army. Mahesh Narayan directs a film that unfolds in two very different parts, one in Kerala and one in Tikrit, with the second being the largest one. The two parts differ both in context and aesthetics, since the former deals with the status of women in Malayalam society while the second with the atrocities of the ISIS army. In that fashion, the first part features a relatively slow pace while Sanu John Vargese's cinematography aims at presenting the situation in the hospital and the various places Sameera visits as realistically as possible, in art-house fashion, with very few "outbreaks." In the second part though, Narayan (who was an editor before becoming a filmmaker) and Abhilash Balachandran's editing makes the pace much faster, as the movie turns into an agonizing thriller, while the cinematography aims at portraying the grotesque situation in the ISIS-infested areas with brutal realism. This realism is also stressed by the actual footage of the events in the end of the film, and by the fact that Narayan kept the parts where the nurses admit that ISIS soldiers did not mishandle them in any way. I have to admit though, that the transition between the two parts is not so smooth, to the point that the film seems somewhat disconnected, since the two parts differ significantly, as if two different movies came together, instead of a compact one. On a secondary level, and this may well be just a misconception of mine, I felt that the film implies that Sameera's decision to leave her husband and son behind is the reason for what happens to her in Iraq, although the ending definitely "compensates" for this sense. Narayanan keeps Sameera at the epicenter of the production at all times, highlighting the different situations she experiences and the toll they have on her psychological status. In that fashion, we witness her being frustrated, sad, confused, filled with agony, scared to death, but always determined and with a resolve that eventually proves her biggest weapon. Parvathy Thiruvoth manages to portray all of the aforementioned with artistry and competence, anchoring the film in impressive fashion. Kunchacko Boban as Shaheed is also quite good in the portrayal of a man who is willing to go to extremes for the woman he loves, in a combination of kindness, understanding, but equal resolve with Sameera's. 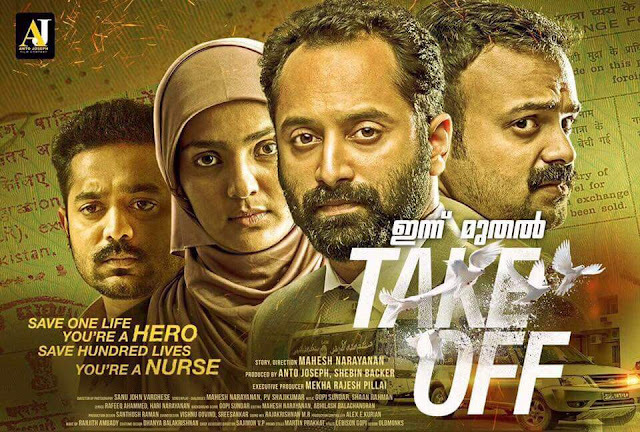 "Take Off" has some faults, but overall, is a film of quality that manages to portray its story with precision and artistry, while Parvathy's impressive performance takes care of the entertainment aspect.